William Everson, Earth Poetry (1980). Robert Hawley, founder of Oyez Press, was, in the last days of Black Mountain College, a student of John Wieners, Robert Duncan, and Charles Olson. Along with many of his fellow students, Hawley, originally from Wisconsin, landed in San Francisco, where he worked as a book scout and later with the Holmes Book Company for nearly twenty years. The Oyez Press was conceived in a series of conversations with Stevens Van Strum of Cody’s Books at the Jabberwock Coffee House on Berkeley’s Telegraph Avenue. The first Oyez publications were ten broadside poems, one each by Robert Duncan, Robert Creeley, Michael McClure, Denise Levertov, David Meltzer, Josephine Miles, Charles Olson, Brother Antoninus (William Everson), Gary Snyder, and William Bronk, designed and printed across the bay by David Haselwood at the Auerhahn Press. The first Oyez book was poet David Meltzer’s The Process, printed by Graham Mackintosh, who also printed many of the early Black Sparrow books. Both Meltzer and Mackintosh were great influences on the growth of Oyez, which published multiple works by Olson, Duncan, Sister Mary Norbert Korte, Mary Fabilli, and William Everson, as well as books by Thomas Parkinson and Josephine Miles, professors at the nearby University of California (Parkinson was an early defender of the Beats). Among the last books published by the press was a facsimile reprint of a unique copy of Jack Spicer’s ironically titled Collected Poems (1968) from the library of Josephine Miles. 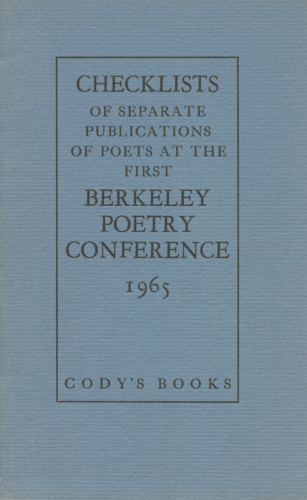 The press also published many items anonymously, including a free Checklist of the Separate Publications of Poets of the First Berkeley Poetry Conference of 1965. This conference, a two-week-long extravaganza of readings, seminars, and workshops, was planned to increase the visibility of the New American Poetry and to introduce new poets to each other. It was in some ways a continuation of a similar conference in Vancouver two years earlier, described in Carol Bergé’s The Vancouver Report, published by Ed Sanders in 1964. * According to Robert Hawley: “From 1964 through 1986 we published about 130 items. Then in 1992 we issued Samuel Charters’ wonderful A Country Year, and in 1996 a keepsake featuring two poems of Tomas Tranströmer, a friend and world-class poet.” — R. deBretfield Hawley, “Oyez: A Comment,” in Dave Bohn’s Oyez: The Authorized Checklist (Berkeley, n.p., 1997). Ann Charters, Olson/Melville: A Study in Affinity (1968). Charters, Ann. Olson/Melville: A Study in Affinity. 1968. Duncan, Robert. Medea at Kolchis. 1965. Cover drawing by the author. Duncan, Robert. Passages 22–27 of the War. 1966. Duncan, Robert. The Years as Catches: First Poems 1939–1946. 1966. Eigner, Larry. Selected Poems. 1972. Edited by Samuel Charters and Andrea Wyatt. [Everson, William] Brother Antoninus. The City Does Not Die. 1969. Everson, William. Earth Poetry: Selected Essays and Interviews 1950–1977. 1980. Edited by Lee Bartlett. Everson, William. In the Fictive Wish. 1967. Everson, William. Single Source: The Early Poems of William Everson. 1966. Introduction by Robert Duncan. Fabilli, Mary. The Animal Kingdom: Poems 1964–1974. 1975. Fabilli, Mary. Aurora Bligh & Early Poems. 1968. Fabilli, Mary. The Old Ones: Poems. 1966. Linoleum blocks by the author. Ginsberg, Allen. Kral Majales. 1965. Broadside. Illustrated by Robert LaVigne. Korn, Richard. The Judgment of the Condor. 1978. Korte, Mary Norbert. Beginning of Lines: Response to Albion Moonlight. 1968. Cover photograph by Betty Berenson. Korte, Mary Norbert. Lines Bending. 1978. Korte, Mary Norbert. Mammals of Delight. 1978. Lamantia, Philip. Touch of the Marvelous. 1966. Printed at the Auerhahn Press. Levertov, Denise. Summer Poems 1969. 1970. Meltzer, David. Blue Rags. 1974. Meltzer, David. The Dark Continent. 1967. Cover by Peter LeBlanc. Meltzer, David. Two Way Mirror: A Poetry Notebook. 1977. Miles, Josephine. Fields of Learning. 1968. Olson, Charles. The Special View of History. 1970. Edited and with an introduction by Ann Charters. Parkinson, Thomas. Thanatos: Earth Poems. 1965. Illustrated by Ariel Parkinson. Spicer, Jack. Collected Poems 1945–1946. 1981. Published in association with White Rabbit Press. Torregian, Sotère. The Wounded Mattress. 1970. Introduction by Philip Lamantia. Vinograd, Julia. Berkeley Street Cannibals: New and Selected Work 1969–1976. 1976. Welch, Lew. On Out. 1965. Frontispiece photograph of the author by Jim Hatch. Wyatt, Andrea. A Bibliography of Works by Larry Eigner 1937–1969. 1970. Wyatt, Andrea. Three Rooms. 1970. Checklists of Separate Publications of Poets at the First Berkeley Poetry Conference (1965). Compiled for Cody’s Books by Oyez editors.